Vatican nuns and the Church of England's female bishops: Was last week actually good for Christian women? 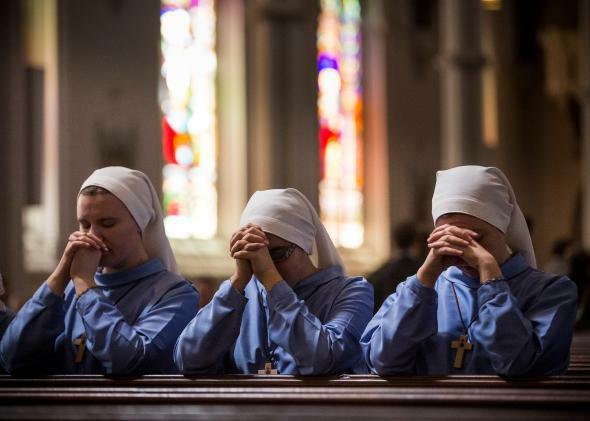 Nuns kneel in prayer in Boston on April 20, 2014. On Dec. 16, the Vatican concluded its six-year investigation into the lives of American nuns. It was a big week for female religious leaders. Last Tuesday, the Vatican ended its six-year investigation into the lives of American nuns with an approving report. And, on Wednesday, the Church of England appointed its first female bishop. On the surface, the moves portend good things for Christian women. In reality, they just highlight how bad things have been—and still are—for many of the most active women in the church. In 2008, the Vatican launched an investigation into American nuns because the nuns were thought to have a “secular mentality” due to their commitment to social justice. Tuesday’s report concluded by encouraging the nuns to essentially continue doing what they’ve been doing: work toward “the elimination of the structural causes of poverty.” It’s tempting to think of the report as a six-year nuisance that ultimately reinforced the nuns’ relevance. But the very existence of the inquiry was a chauvinistic exercise that rightly outraged many Catholics. The Nun Justice Project deemed it a “huge waste of time” and “demeaning.” And on WBUR last week, Simone Campbell of Nuns on the Bus reminded us of some of the other things that the church had to worry about in 2008—like pedophilia, lack of fiscal responsibility, and generally poor management. In light of those troubles, it’s baffling that the church chose to pick on the Catholic sisters for scrutiny. The report also concluded with Pope Francis’ call “to create still broader opportunities for a more incisive female presence in the church.” Sounds good. But as the New York Times pointed out, the church didn’t propose any actual suggestions for how to go about doing this. Perhaps if the church had spent the last six years investigating its own treatment of women, instead of scrutinizing how women themselves are behaving, it might have made some progress. After all, the Catholic Church doesn’t just need to find a way to “broaden” female participation. It also needs to figure out how to retain the women it already has. The report reveals that there are only about 50,000 nuns in the U.S., less than half the number there were in the mid-1960s. Other studies have pointed out that the median age for nuns is now in the late 70s. And those remaining, aging nuns are typically underpaid for their work running Catholic hospitals and schools. And yet, the Catholic Church is still putting nuns on the defensive: It’s now in the midst of conducting another nun review. This one is focusing on the Leadership Conference of Women Religious, an umbrella group representing about 80 percent of American nuns, who are accused of indulging in “radical feminist themes” and therefore straying from Catholic doctrine. It’s not clear when that review will be finished. Rev. 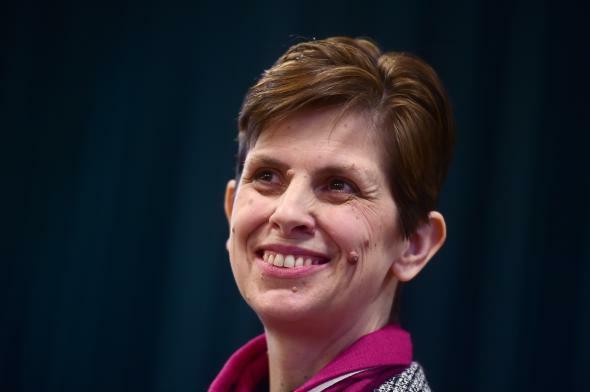 Libby Lane, the newly appointed bishop of Stockport. Across the pond, the Church of England finally named its first female bishop, Rev. Libby Lane. Lane’s appointment followed the Nov. 17 adoption of legislation freeing women for the job. That’s a big deal, especially considering that this same legislation failed by six votes in the House of Laity just two years ago. (Women have served as bishops in the Episcopal Church in the United States, part of the broader Anglican community, since 1989.) Lane, who was one of eight female clerics who held “observer status” in the church’s House of Bishops, has impressive stats—the Guardian calls her “one of the most influential women in the church.” Those impeccable credentials seem designed as a bulwark against heavy and consistent opposition from figures like the Rev. Rod Thomas, the head of the conservative group Reform. But the church has also made moves to appease those who object to female leadership. As agreed in July, the church will permit parishes that are reluctant to introduce a female bishop to request a man to replace her. * And while Lane’s appointment makes for splashy news, the reality for most female leaders in the church remains dire. Just about one-half of female clergy are unpaid, and a majority of female clergy aren’t even running their own parishes. Even Rev. Lane, who will be the bishop of Stockport, has been appointed to a position that, as the Times points out, “lacks the status of a full, diocesan bishop.” The bishop of Stockport is a suffragan bishop, a junior position that’s subordinate to the diocesan bishop—and in the Diocese of Chester, where Stockport is located, that more powerful position is still filled by a man. So Rev. Thomas, who says he “grieves” the decision to appoint a woman as bishop, is now calling on the bishop of Chester to “enable the many thriving conservative evangelical churches in his diocese to continue to serve their communities with theological integrity under the oversight of a male bishop.” For all the progress that’s been made, there are still some inside the church holding out hope that men will keep these women in line. Correction, Dec. 24, 2014: This post originally misstated that the Church of England allows parishes that are reluctant to have female bishops to request a male bishop to supervise. The church allows those parishes to request a male bishop to replace her.